Here’s a bulletin board idea that can work for Mother’s Day and/or Father’s Day. This is also an idea that can be for your class, for your Children’s Ministry, or for your entire church. Print out the form and pass it out to everyone you want involved. They will write down memories of their parents and then turn back the form back into you. This is where you can get creative. For Mother’s Day, you can decorate the bulletin board space to look like a garden or maybe even a tea party. Then you can add the memories of the people as flowers in your garden, or tea cups at your party. For Father’s Day, you can have a clothesline of ties with the memories written on the ties. 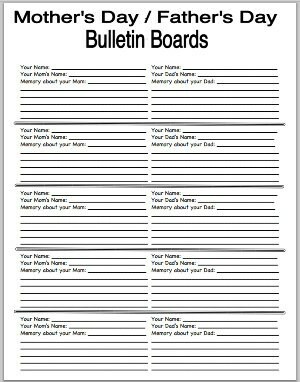 Memories are personal to people and this is a great way to get more involved in your bulletin board while honoring parents in the mean time. You can include some mother’s day or father’s day coloring sheets along side too. Don’t forget about the mother’s day poems and Bible verses about moms. We’d love hear back from you. Leave a comment below to tell us about your bulletin board. Better yet, share a picture with @tonykummer on Twitter. Tony Kummer (Editor) reviewed & updated this page on : May 8, 2014 at 8:29 am. All our content is peer reviewed by our readers, simply leave a comment on any post suggest an update.